In this era of mass surveillance, we have always learned from security folks to protect and encrypt our communication and networks, especially widely open private Wi-Fi networks. It is always recommended to use a strong password and encryption on Wireless Routers in an effort to safeguard the privacy and security of our web communication and personal data. Quite the contrary, a group of activists says opening up your home Wi-Fi network could not only enhance your privacy, but actually increase it in the process. A new movement dubbed as “Open Wireless Movement” is encouraging the users to open-up their private network or at least a small portion of the available bandwidth to strangers. It really sounds quite annoying! Isn’t it? In this case any unknown can consume a large part of your network bandwidth or can use your network to perform illicit activities, and it will come as a great boon for those cyber thieves who are in wake of finding such open networks to carry out cyber theft. 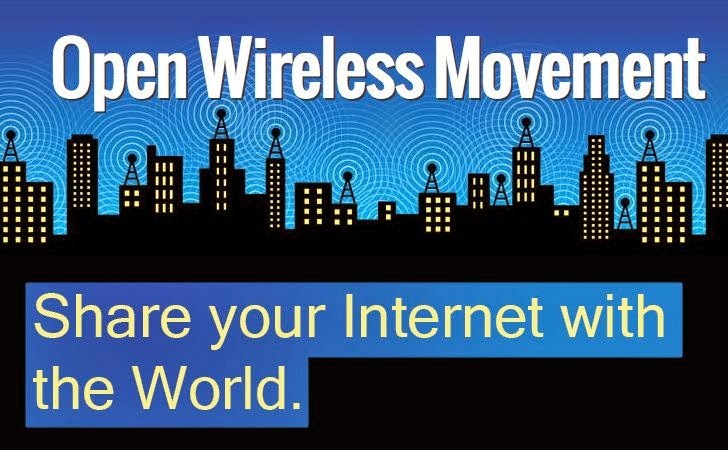 “The Open Wireless Movement is a coalition of Internet freedom advocates, companies, organizations, and technologists working to develop new wireless technologies and to inspire a movement of Internet openness”, reads the explanation about the Open Wireless Movement. The OpenWireless.org website explains the group’s initiative in which a number of non-profit as well as pro-internet rights organizations including the Electronic Frontier Foundation (EFF), Free Press, Mozilla, and Fight for the Future are in collaboration among others to make this possible. The Electronic Frontier Foundation (EFF) is working on one such technology and is planning to release a flavor of free, open-source router firmware, which they dubbed as "Open Wireless Router", at the Hackers on Planet Earth (HOPE X) conference to be held next month on New York. This firmware will let you share a portion of your partially open Wi-Fi network with anyone nearby without a need of password. The Open Wireless Router firmware will help public to access a small pre-defined amount of your network bandwidth and in this way, you can allow anyone nearby or passers-by to check their Gmail, online messages or voice calls from your private Wi-Fi, while discouraging them from downloading a multi-gigabyte file, as it limits the freeloaders to access as little as 5 percent of your bandwidth. Now, one more problem is that if we will offer our private network to the strangers then we could face a bad browsing experience. For this, EFF says that the Open Wireless Router firmware uses the smart technology that has been designed by keeping priorities of the owner in mind. This means the owner of the private Wi-Fi network will be kept on the top priority over others, so they will not at all experience any fall in their browsing experience. Also the firmware has been built in such a way that every connection is walled off from other connections thereby decreasing the threat of unwanted snooping. Furthermore, EFF also believes that the movement will make it more difficult to tie an IP address to an individual. So, this solves rest of your problems. Now, let’s see this effort will come up as a boon for normal public or will offer cybercriminals one more way to attack us. For now I have no idea that how "Open Wireless Router" from EFF will defend Wi-Fi owners in case someone misuse their IP Address to do illegal activities or cyber attacks. Security guru Bruce Schneier blogged about a logical solution for this problem. He said,"if someone did commit a crime using my network the police might visit, but what better defense is there than the fact that I have an open wireless network? If I enabled wireless security on my network and someone hacked it, I would have a far harder time proving my innocence." But every coin has two faces, for example - a bad actor can intentionally open his own Wireless Router for others to prove his innocence in legal issues, no matters anyone else ever use it or not. I will update the article with an answer of the last Problem. Please comment below to share your thoughts about the move.